Fire season is upon us. Each year an estimated 1,100 wildfires burn in DNR protection areas (about half the state, generally the more forested areas) and another estimated 2,500 wildfires burn in parts of the state where fire departments are the primary responders. Two-thirds of these fires occur in spring. There is a great deal of dry vegetation and fallen leaves and other debris present this time of year, which is quick to dry out. Accompanied by warmer weather, drops in humidity and gusty winds, wildfires can quickly ignite and spread. So far this year,75 fires have occurred, burning 569 acres. Main fire causes have been debris burning and equipment; 25 structures have been threatened by these fires and 2 buildings have been destroyed. With the nicer weather, homeowners are cleaning up around their properties, sometimes choosing to burn leaves and branch debris. Debris burning is the leading cause of wildfires, especially this time of year. Burning is not your only option. Try alternatives such as composting or leaving brush in the woods for wildlife cover. The best practice is to not burn at all or to wait until surrounding vegetation greens-up in the summer. If you wish to burn, get a burning permit and follow the rules of the day. You can stay aware of fire danger and burning permit requirements by checking our website dnr.wi.gov, keyword “fire” or calling 1-888-WIS-BURN. 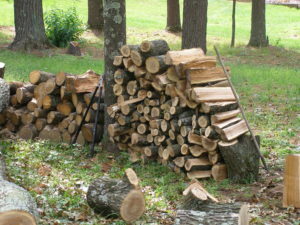 Information is updated each day at 11 a.m.
Move firewood at least 30 feet away from your home. Firewise Tip: If you burn wood for home heating, it’s time to move any remaining firewood stacked near your home to a spot that’s at least 30 feet away. If you dump wood ash outdoors, spread the ash in an area free of vegetation and debris and drown with water to make sure any hidden embers are fully extinguished. Or leave the ash in a metal bucket with a tight- fitting lid until it is completely cool.